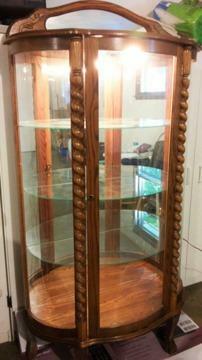 Gorgeous Curio Cabinet with key, beautiful etched glass asking $320.00 OBO call 801-603-0956. Full mirror, 3 adjustable glass shelves, lighted, mirrored backsplash, claw feet. 33' w. x 14.5' d. x 65' h.Very good condition. Missing key.